We’ve been busy here at RobMark, but hard work always pays off. We are thrilled to announce the launch of McCorkleJohnson.com! McCorkle & Johnson, LLP is a downtown Savannah-based law firm that provides services to clients in Georgia and South Carolina. 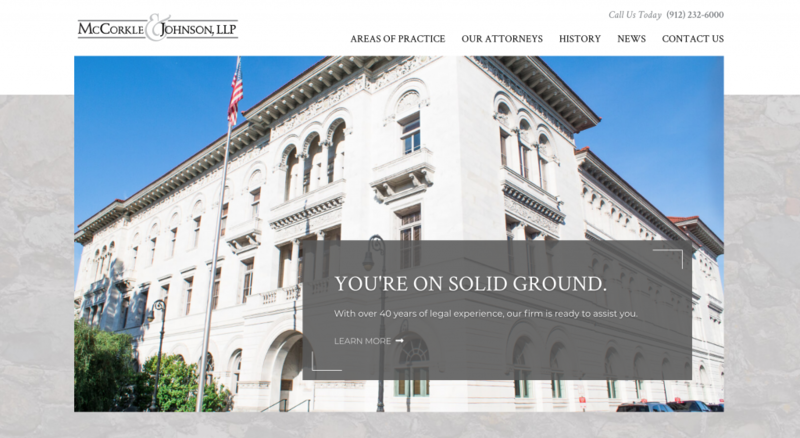 As competition in the legal industry continues to grow, McCorkle & Johnson, LLP was in need of a website that would make them a strong force in today’s digital world. When people are searching the internet for legal advice, it’s important that they can find the information they need as quick and easily as possible. To cater to this need, we designed the site with a simple, organized layout with each area of practice and its specific services listed on its own page. A user can also get to know each of the lawyers, explore the firm’s history, and keep up with the firm’s latest accomplishments and news. With the website’s responsive design, a user can navigate the website from a desktop, tablet, or mobile device. To give it a personalized touch, McCorkle & Johnson, LLP’s new website features eye-catching photography that corresponds with the purpose of each page, many of which are authentic photos of downtown Savannah and the firm’s office. Head over to McCorkleJohnson.com to see the new website!